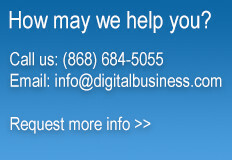 At Digital Business we aim to provide convenience and ease to consumers through the use of technology. In driving this initiative we have developed various products that increase efficiency and productivity while minimizing human effort. These products include Digital Tenders, Digital Candidate Manager, Digital Scorecard Manager and Caribbean Tenders. Our company continues to evolve and is constantly seeking new ways to maximize on technological advancements. Digital-Tenders is a web-based application that provides the essential functionality to manage tendering, procurement and contracting effectively to reduce cost, increase efficiency, improve transparency and reduce risk. Digital Scorecard Manager allows organizations to build and manage scorecards without the need for IT support. Digital Candidate Manager helps organizations to meet the major challenges of rising cost, staff shortages & high turnover via an advanced recruitment system that spans the recruitment life-cycle. GovTT PM Central Reporting Portal is a Project Management Portal based on SharePoint 2010 & SharePoint 2013 that fulfills the requirements of the Ministry of Planning Trinidad & Tobago for Reporting Purposes on PSIP Projects.